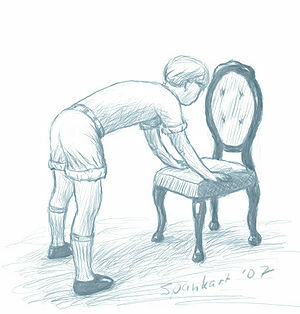 The hands-on-chair position is a common variant of the bent-over position. It is a spanking position in which the spankee is standing, with his/her hands (or forearms) placed on the seat of a chair, stool or similar piece of furniture that is about knee high (e.g. a bench, piano bench, pouffe, couch, armchair, coffee table). The solid support at a convenient height makes the position easier to assume and hold than the hands-on-knees position. Still there is no support under the spankee's hips in this position. In a variant, the chair is turned such that the spankee has to bend over the chair's back to reach the seat. Depending on the size of the spankee and the chair, this can create pressure on the spankee's abdomen, and force them to stand on tiptoes. Another variant is to place the hands on the top of a table or desk. This is higher and results in a standing position that is only slightly bent over. This page was last edited on 18 December 2016, at 20:40.